These cookies are from an old family recipe, passed to me by my great-grandmother; they are rich and addictive. More cakey than crisp, I've tested them at 350 degrees, but if your oven cooks "hot," you might wish to lower the temperature to 325; the recipe comes with the proviso that "they burn easily" (although I've never had that problem). Finally, they stay fresh, stored in an airtight container, only for a few days, but they freeze well (also stored in an airtight container) for a couple of weeks. Make the cookies: Melt 4 oz. chocolate in a double boiler over the stove (if you don't have a double boiler, improvise by nesting a stainless steel bowl over a pan of simmering water). Set aside. In a separate bowl, cream butter and brown sugar. Add eggs and blend well. Add chocolate and blend. Combine vanilla and milk. Stir ⅓ flour mixture into the butter-sugar-eggs; add ⅓ vanilla-milk. Continue until all ingredients are combined; stir in nuts if using. Drop by rounded teaspoonfuls onto cookie sheets, spacing them 2 inches apart. Bake 10 minutes. Watch carefully to prevent burning. Remove cookies to a rack to cool. 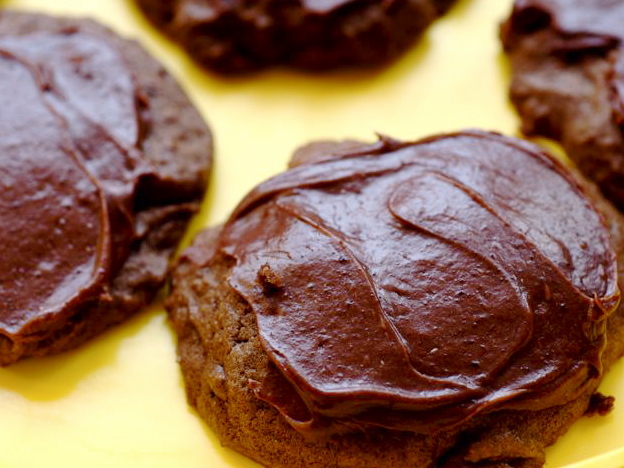 Make the frosting: Combine chocolate, butter, and water; melt together. Remove from heat and add egg whites and vanilla. Add confectioners' sugar until frosting reaches a spreading consistency. Frost cookies and store in airtight containers. If you stack them, separate the layers with waxed paper.